Kosakenpatrouille [Russian] [2:30] Same as Kosakenpatrouille on the Beim Klang der Balalaika LP & Meadowland on the U.S. Ivan Rebroff LP. Auf der Strasse nach St Petersburg [Russian] [2:08] Also available as Wdol Po Piterskoj on the My Russian Homeland CD. Schiwago-Melodie [Russian] [3:05] Same as on the Beim Klang der Balalaika & U.S. Ivan Rebroff LPs. Also available on the Simply The Best CD. Na Sdarowje [Russian] [2:54] Same as on Na Zdrovye LP. Bessarabyanka [Russian] [2:13] Same as on the Na Zdrovye LP. Natascha [Russian] [1:52] Same as on the Beim Klang der Balalaika LP. Also available on the Meine Reise um die Welt & Stenka Rasin CDs. Wolgaschlepper [Russian] [2:28] a cappella beginning, also available on the Kalinka CD. Teure Heimat [2:51] (from the opera Nabucco). Also available on the Musikalische Edelsteine CD. Am Brunnen vor dem Tore [3:18] Same as on the Melodien für Millionen LP. Also available on the Meine Reise um die Welt CD. Lebe dein Leben (Mattinata) [3:15] Also available on the Musikalische Edelsteine & From The World CDs. Die Mouldau [?] [3:19] Also available on the Musikalische Edelsteine & Frühling in der Taiga CDs. Here the arrangement works; we don’t get that jolting transition from the familiar intro like we do on Teure Heimat. Wenn ich einmal Reich Wär [German] [5:50] Laid-back. Only available here. Mutters Hände (A Jiddische Momme) [2:56] Also available on the The Very Best of Ivan Rebroff Volume II & From The World CDs. Abenglocken [Russian] [3:23] the a cappella mens' chorus version. Is this Ivan multi-tracked? Also available on the Glasnost Perestroika CD. Die Trommel [German] [3:38] Also available on the Meine russischen Träume CD. Am Don, am stillen don [German] [5:43] Also available on the Meine russischen Träume CD. Die Glock von St Dimitri [German] [4:23] Also available on the Meine russischen Träume CD. Des Teufels don Kosaken [German] [3:50] Also available on the Russisches Schätzkastlein & German Ivan Rebroff CDs. Das Schicksal ist so wie der Wind [4:08] Same as on the Taiga-Träume LP. Der Bär und die Lerche [5:27] Also available on the Meine russischen Träume CD. A really tedious piece with bassoon and flute. Grosser alter don [German] [3:53] Same as on the Reich Mir Die Hand LP. 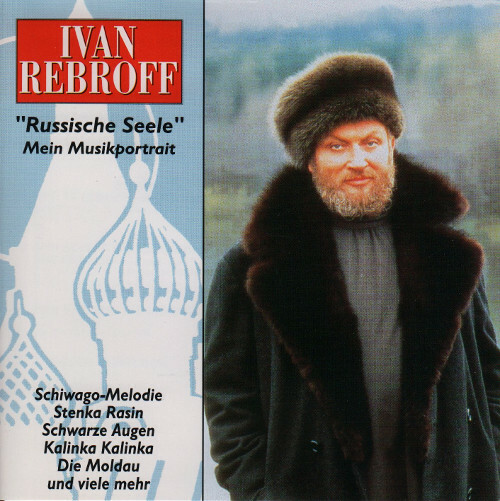 Also available on the Glasnost Perestroika & The Very Best of Ivan Rebroff CDs. Stenka Rasin [Russian] [3:33] Available on the Crowning of a Great Career CD. Nobody knows the trouble I've seen [English] [1:58] This is an edited version of the track on the Live in Concert CD. It's missing the charming intro explaining why he's singing this. Die Legende von den 12 Räubern [Russian] [3:43] Also available as La Legende des 12 Brigands on the Ses Plus Grands Succes CD. Same as The Legend of the 12 Robbers on the Folk Songs from Old Russia LP. Schwarze Augen [4:07] Also available as Otschi Tschornyje on the My Russian Homeland CD. Zwei Gitarren [Russian] [3:31] Also avaialable as Les 2 Guitares on the Ses Plus Grands Succes CD. Kalinka Kalinka [4:01] Also available on the Kalinka, Simply The Best, The Very Best of Ivan Rebroff & Ses Plus Grands Succes CDs. Im Tiefen Keller [3:53] Also available on the The Very Best of Ivan Rebroff CD.